Three of Handel's early dramatic cantatas for one, two and three voices are staged in a fully costumed concert with a chamber ensemble of continuo (harpsichord and cello), strings and a baroque trumpet. Composed during Handel's time in Italy, these cantatas were written for his most important Roman patron, the Marchese Francesco Ruspoli. Handel was the musician in residence at Ruspoli's Palazzo Bonelli in Rome. 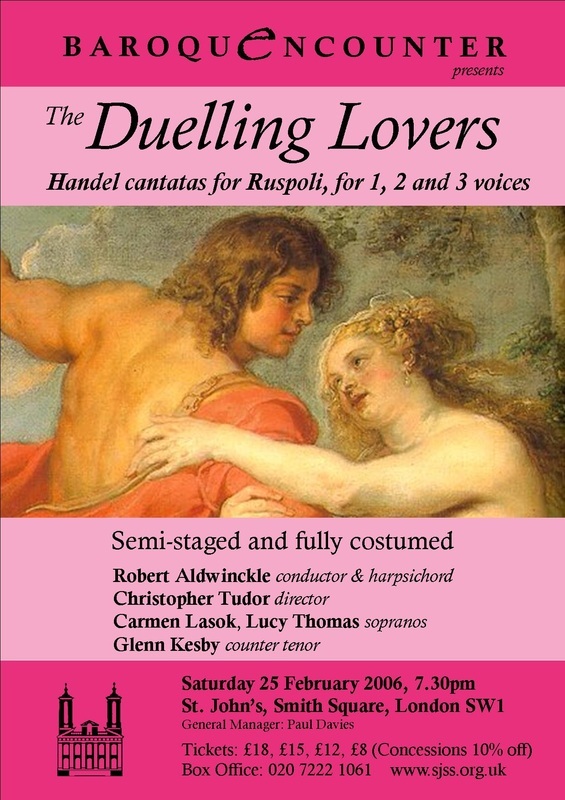 The cantatas were performed at the Arcadian Academy of which Ruspoli was a leading member. Amarilli Vezzosa (or Il Duello Amoroso) is an encounter between the shepherd Daliso and the shepherdess Amarilli. The shepherdess once pledged her love to the shepherd but has now changed her mind. Daliso, resentful at being rejected, threatens to use force to gain his desire. But he is outsmarted by the wiles of Amarilli who shames him into an apology then mockingly hints that she would have relented if he had only been a little bolder! Tu fedel? Tu costante? is slightly unusual for the baroque period as it tells the story from the woman's point of view. It deals with the problem of an unfaithful lover, with lots of fire, passion and vengeance! O come chiare e belle (or Olinto pastore, Tebro fiume, Gloria) represents Rome as the River Tiber and shows the shepherd Olinto calling Glory to raise the Tiber from his declined state at the end of the Roman Empire to renewed magnificence at the start of the Holy Christian Empire.